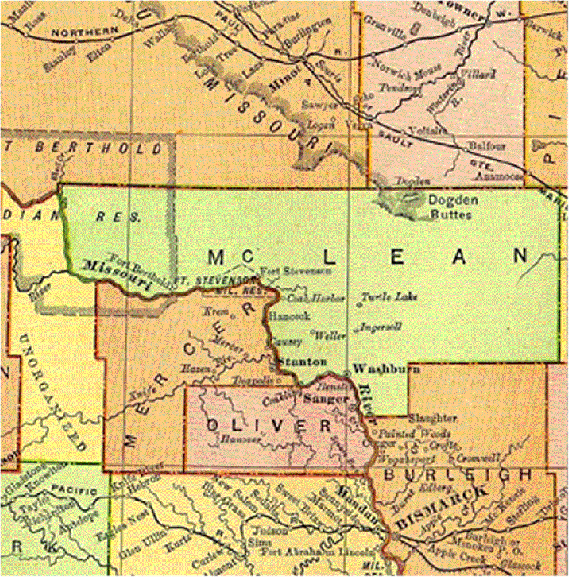 1895 Map showing McLean County area, plus Bismarck to Fort Berthold road by way of “River Road,” a stage coach route which went past our house in Elm Point. 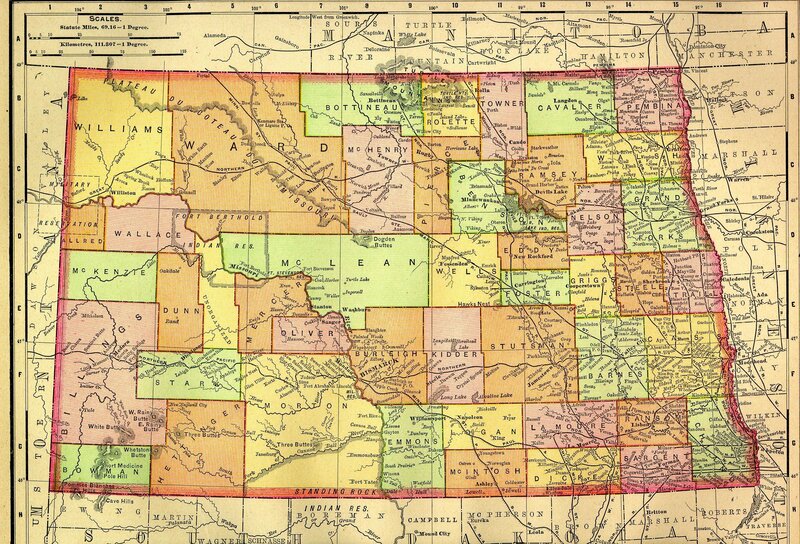 Isaac Larson contracted Rocky Mountain fever (late summer 1886) while working on the railroad in Velva/Mouse River area, and died shortly afterwards, (the night he got home to his wife, Martha and family at his homestead and shack east of Washburn). Note Velva, where John Ecklund, Sr. was killed in wagon/horses’ accident, when hauling wheat for shipping in 1900. Hancock would more accurately be shown just south of Weller. Elm Point is a region east of the Missouri River (called the Lewis and Clark area that includes lands west of Hancock). Weller includes the Basto/Birka Church and community. That is where Adolph and Annie Reimers first homesteaded with his parents, Elsa and Godfrey. The annual Basto picnic of June 24 (mid-summer day) was held on the Gradin/Peterson land just west of us, near the Missouri River. Our home was the original John Eklund or Mary (Mari) and John Ecklund homestead. Eklund spelling here is not a typo. John originally thought the Swedish "Ek" (oak) "lund" (land) a good choice for new name, since he thought there were already too manyJohn Ericksons, his Swedish name. The homestead BLM patent for 144-N 84-W McLean North Dakota was issued August 16,1889 to John Eklund. Be prepared for a long download, however; but it is worth the wait. The earlier map from the 1888 web site lets you compare the changes of seven years!